Digger John's Garret Studio: What happened on November 14? Apart from our garden project starting, that is, of which more in a later post. No, I'm talking about the extraordinary explosion in my blog activity. Page views to be precise. I haven't really paid much attention to this in the past. I know who my main readers are (hi people! Kiss kiss) and I also get a bit of passing traffic, but I'm never going to be in anyone's "top ten" blog list, or make enough to live on from the revenue generated by any click-throughs on my ads, so I only visit the overview and stats pages two or three times a year out of interest. I did a bit of a double take to be honest. At first glance it looked like most of my readers had evaporated. Then I noticed the scale and realised Blogger had adjusted the graph to cope with the new peak. 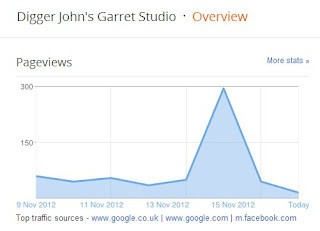 293 page views in a single day. I have no idea what happened. Is it one new reader (hello!) catching up with several months of posts? A handful of people all catching up with a slightly smaller backlog, but all at once? Or a large number of people attracted by some unknown publicity all paying me a visit and reading a couple of pages each? I just don't know. But whoever you are... don't go! Pull up a chair. Sometimes it gets quite interesting around here :0) Especially if you like decorating. The only inkling I have about what caused that enormous spike is that I had recently advertised War of Nutrition on a "local interest" Facebook page. But I only posted that Amazon link, so anyone spotting it would have had to click through several pages or do some research to find this blog. I can't believe 293 people all did that! Weird. It's back to normal now though, as you can tell from the graph.